Do you want to learn an easy Beatles piano song? Do you love the Beatles song Yesterday? Would you like to learn a super cool left hand piano pattern to help you expand your piano arrangements? Why not take 5 minutes and watch this video. I’ll show you how to play the verse (A Section) of Yesterday and teach you how to expand these chords. We’ll also talk about some piano technique tips to help you grab the left hand piano chords more easily. Here are the chords and the sheet music for Yesterday. Hopefully this will help you visually see what the left hand chords look like arpeggiated. Please also note that I simplified the melody in this arrangement to make it a little easier so everybody can play it. If you haven’t done so already, I highly recommend you watch and listen as well to the video. A very important part of learning contemporary styles is to listen as well as read the music. This short little Yesterday piano arrangement is no exception! Be sure to also scroll down to explore a bunch of extra to help you learn more about this left hand arpeggiation pattern and playing this Beatles piano song. 1. The left hand arpeggio pattern I teach is very easy to play. First, start with a basic major triad. Then move the bottom and top notes down an octave. These are the root and 5th of the chord. The 3rd of the chord is kept the same and is now the top note of the chord. If you want an example of how to do this please watch the video above or take a look at the first F chord in the Yesterday sheet music. 2. This left hand arpeggio pattern I teach you in this lesson is actually quite similar to an alberti bass pattern. If you’ve played classical music before you should be quite familiar with this concept. Composer like Mozart and many other classical composers used it. Essentially, you arpeggiate a left hand chord by playing the bottom note first, then the top note, then the middle note, and then the top note again…just like we do in the video above. Often times the alberti bass features block piano chords more toward the middle of the piano. If you’re a beginner to piano and want to learn more about how to play these block chords out my lesson on lesson on the F major piano chord and the C piano chord. 3. Along these lines if you wanted to simplify this arrangement more you could just play block chords in your left hand and note even worry about arpeggiating. 4. The left hand piano pattern I teach in this video could theoretically work well at different tempos but it will particularly work great on ballads. 5. If your hands are too small to grab the expanded left hand chords just roll your hands and use the sustain pedal to help you. Make sure you move the pinky with you as your thumb travels up the keyboard. This will help you avoid tension in your hand. 6. Notice how the melody starts on a non chord tone (the 9th of the chord) and then eventually resolves down to the root. By starting the melody on a non chord tone Paul McCartney creates a really subtle need for resolution and it propels the arrangement forward. We do get our resolution a couple beats later and it sounds really pleasing to the ear. This is a very common melody technique. It’s been used in hundreds of popular songs in both rock, pop, classical, jazz, and many other genres. If you want to learn more about how to use the 9th check out this lesson on how to decorate major chords using the 9th. 7. Most of the melody of this tune moves in stepwise motion. As a result of the stepwise motion this song fits particularly well on piano. 8. If you want to learn more about some pop piano techniques I also recommend you check out this piano lesson on Margaritaville. 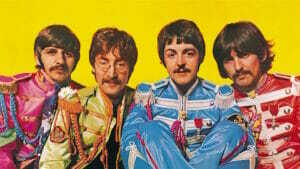 I hope you had fun with this Beatles piano lesson and had fun learning the left hand arpeggio pattern. I recommend you spend some time practicing Yesterday and also applying the left hand arpeggio pattern to other songs you enjoy. If I get enough requests I’ll teach you how to play the B section of Yesterday in another lesson. I also plan on teaching some other Beatles piano arrangements at another point. Keep checking back on the site! Update: I have created several new Beatles lessons. You can check out my Let It Be Piano Tutorial, our Hey Jude piano lesson, and my Imagine Piano Tutorial right here. Happy practicing everybody and see you soon! Did you enjoy this Beatles piano lesson? Do you have questions? Please leave a comment below and let me know. If you’re completely new here I highly recommend you subscribe to the free pianolessonsonline.com email list. You’ll receive new lessons in your inbox as soon as their published. You can subscribe on the top right of the site or right below this article. See you on the other side! Steve many thanks for showing this tutorial on the Beatles song Yesterday hopefully you will do some more Beatles Tunes or what about Jealous Guy by John Lennon. Paul, are you Ruth Beggell’s cousin? Steve, I want to compliment you on your concise, rapid-fire approach to teaching. You waste no one’s time, and nothing distracts from the lesson’s focus. I’m an old (OLD) guitarist, learning piano for the past 4 yrs. I’ve got ears, and can transcribe, but you’re saving me hours! Thx. It’s truly my pleasure David. Thrilled to hear you’re enjoying the lessons. I have a lot more stuff coming. Stay tuned! Super stoked about the new website! If the premium jazz lesson site comes ou, I won’t know what to choose from. Thanks for your kind words. If your audio is not syncing with the video it has something to do with your current setup. I’m about 99% sure it’s working for everybody else. Make sure you’re running the latest version of your browser and restart your browser. Also, the videos are in HD so there is a possibility that your internet connection may lag a bit. Try letting the video start then press pause. This will preload a lot of the video in advance. Hope this helps. If anybody else is having an issue with this please feel free to leave a comment. It’s super to be able to learn with you, thanks a million! Hi Steve. I have been getting your jazz lessons for about a year. Love it! Thanks for providing this service. I signed up for pianolessonsonline a few months ago but have not gotten anything in my email. I tried to reapply but I got an automatic answer that I was already on the list. If you can help I will really aappreciate it. I look forward to getting lessons in my email! Would love to see the B section treatment. Will try to post something in the future. Thanks Jim. Hi Steve I would appreciate to send the whole song of yesterday, I’m learning a lot with their lessons. You’re most welcome and glad to hear you’re learning Francesc. Thank you Steve for a wonderful tutorial. I love ballads. Could you teach us to play “Can’t help falling in love” by Elvis P.
Glad you found it useful May! I’ll add it to the list of potential future tutorials. Thanks for the suggestion. Could you possibly post or send me the rest of “Yesterday?” I could pay if you’d like (not a lot… I’m a bit of a starving college student, but I’d pay what I could). It’s my mom’s favorite Beatles song, and it would mean a lot if I could play the whole thing for her. Others have mentioned they’d like to know more of this song … I would also love to see the whole song written out! Is there somewhere on the home page to search for things like this? I didn’t see a “search” field but just might not know where to look … thanks! Hey Barb!I plan on doing some more Beatles tutorials and hopefully finish this tutorial soon. Appreciate you checking in! If you go to the new lessons on the top menu bar you can check out several other Beatles piano lessons I’ve created. I hope you enjoy. Thanks for your comment. Love your lick that I applied to “Piano Man” like you demonstrated and it is a nice fill. I can’t wait to add to other songs. 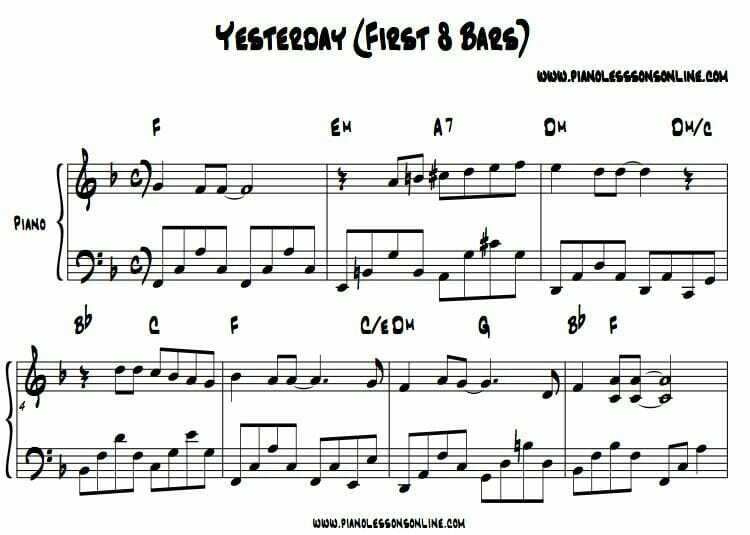 I especially like “Yesterday” The left hand pattern you are playing is one I use in plenty of songs.i learned it from Yoke Wong and she called it the Ballad 10ths. When I was taking piano lessons back a few years ago I was told this was L. H. Running 10ths, as actually came from the Mildred Alexander Method. Madonna Woods, a Gospel teacher also called it Running 10ths. I also liked “Let It Be” so now I’ m working on that song. Thanks for all the tips and licks and all. Please put me on your mailing list. Thank you Marlene! The 10th technique has been used in various capacities for hundreds of years. It’s a great one right? Glad to have you as a new member of the community. Thanks for your comment!